Brace for the brutal force of the bold Vikings as they unleash their fury. Come meet these fearless Norsemen who, relentlessly waged wars for three hundred years. NetEnt continues to impress with impeccable graphics and sounds effects that will transport you to the heart of the battles. The game offers amazing features that would increase your betways from 243 to 78, 125. Ready your swords and spears for you’re about to meet the Vikings. 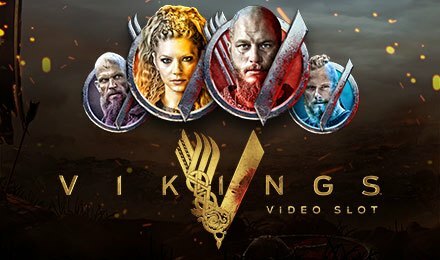 As it is customary, the Vikings Video Slot game requires adjustment of the bet levels, coin value and you can start spinning. 3 or more matching symbols along a payline will trigger a win. The Raid Spins feature can increase the betways to 78 125. The scorching Hotspot feature is simply amazing and will transform your gaming experience. Bet Levels: This Slot game by NetEnt offers 1 to 10 Bet Levels. To adjust the bet levels toggle with the plus and/or minus buttons found under the “Level”. Amount of Paylines Selection: On the main game there are 5-reels, 3-rows and 243 betways. However, the Raid Spins features will change the game as follows; 7-reel, 5-row and 78 125 betways. Coin Values: The coin value can easily be adjusted to the amount you wish by pressing the plus and/or minus buttons under the “Coin Value” tab. You can choose between a minimum of 0.01 up to a maximum of 0.5. In the main game the Hotspot covers the reel 3. Whenever a fully stacked Viking symbol stop in the Hotspot area, all other Viking symbols outside the hotspot will turn into the same Viking symbol that covers the hotspot area. Any of the 4 symbols with a face on it, is a Viking symbol. The only time this feature is triggered is when same symbol covers the entire Hotspot area on all 3 reels. The Shield Wall will randomly show on the reels of the main game and also on the Raid Spins as a group of mystery symbols. The wins are calculated once they’ve shown up. When 3 Raid spin symbols shows on reels 3, 4 and 5 in the main game the Raid Spins feature is triggered. The number of reels will increase to 7 during this feature, the rows will go to 5 and the betways will shoot up to 78, 125. The Hotspot will also increase to 3. On the reels 3, 4 and 5, seven Raid Spins are given with 3 Hotspots.